It's a daily quest and a never-ending commitment for Roger Goodoak of the Maine Homeless Veterans Alliance. 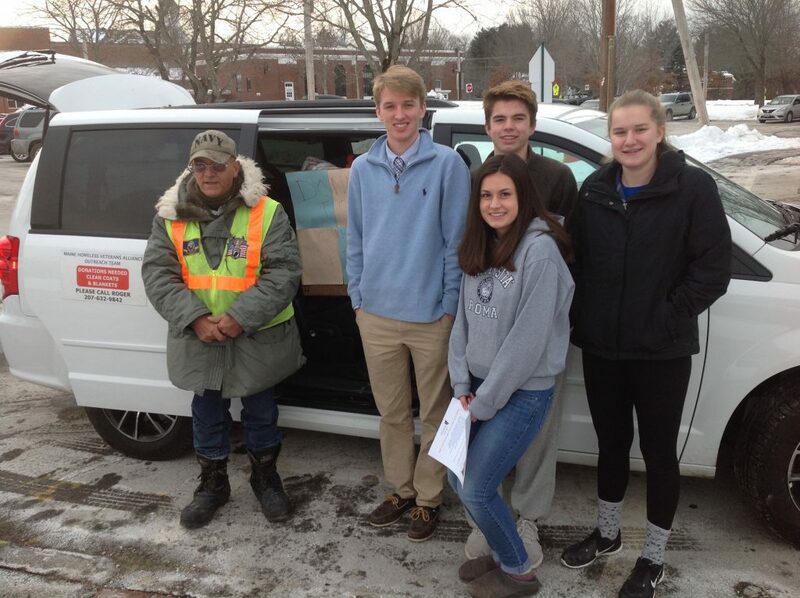 At Greely High School in Cumberland on Tuesday, students and Roger Goodoak of the Maine Homeless Veterans Alliance take a break from loading the MHVA van with clothing, backpacks and toiletries to be distributed to the homeless. The students collected the goods after voting to support the MHVA for their Community Service Club project. From left are Goodoak, A.J. Eisenhart, Quinn Molloy and Rachel Ferris. In front is Hannah Doolittle. Speaking from his little office on State Street in Portland, Roger Goodoak makes it clear that he doesn’t spend much time at a desk. Early on this dark January evening, he’s there only briefly to check out a new letterhead for the nonprofit organization he founded in 2012, the Maine Homeless Veterans Alliance. In practice, this means year-round scouring of southern Maine and beyond to find the homeless in their camps, or wherever, and provide them with bottled water, food, blankets, hats … whatever is needed, including emergency medical care, sometimes. And encouraging people to leave their tents and seek some form of shelter – Oxford Street in Portland, perhaps, and later, ideally, permanent accommo- dations. Sometimes Goodoak will transport people home, as he did one night this week, driving a young couple 75 miles back to family in Rumford. “When presented with a valid reason and even a hint of a chance to get someone off the streets long-term and maybe for good, the MHVA is there to give them that chance,” is Goodoak’s comment, on the organization’s Facebook profile. On the day of our conversation, that effort included an afternoon excursion to outer West Commercial Street in Portland, and a steep scramble up a slippery, muddy hillside to check on a campsite. Goodoak, 63, whose MHVA title is executive director, fell down and got soaked, and seemed to find it rather funny. “I’ve got to get to Wal-Mart to buy some cleats later,” he mused. A Massachusetts native who “had a good career”of 14 years in the Navy before being discharged for alcohol problems in 1986, Goodoak spent subsequent years homeless and “drinking my way across the United States.” He eventually came to Portland a decade ago. Rob Parritt, a housing counselor at the Oxford Street Shelter, “saw hope in me” and connected him with VA programs that stopped his drinking and housineffected a life change, although he has been diagnosed with schizophrenia and PTSD, is disabled, and continues to be treated for medical issues. Recognizing the need (not least thanks to his own experiences) Goodoak founded the MHVA specifically to aid veterans, but its mission “has evolved” to include any homeless people in need. Goodoak estimates that at least 50 members of the public at any one time are helping sustain the all-volunteer MHVA’s efforts. Among them are Mery Simonds, his right-hand person, and his high-school- age children, Kevin and Briana. He cites a long list of “kind people” whose generosity keeps the MHVA afloat. Too often, those things are unfortunate. “Not everybody welcomes me with open arms,” Goodoak said. “A lot of people are afraid, for their own reasons. I ask them to try the shelter, and maybe they do, but they can’t handle it, mentally, psychologically. You can’t force someone. I tell them ‘OK, you did try,’ and give them a tent … I’ve given out two today. “For every ‘win,’ it seems, there are 20 losses, in some form,” he continued. “I was walking in the woods in Biddeford last summer and found a camp with a father, a mother and a young baby. They were petrified. I gave them what I could and told them I’d be back, with formula and more. For more information, to volunteer, or to make a donation, please visit the Maine Homeless Veterans Alliance profile on Facebook.